The survey covers such major technology topics as budgets, networks, security, software, hardware, field access, integration, and much more. The software category coverage is broken down into twelve major software types including: Job Cost/Accounting/Payroll, Estimating, Project Management, Project Collaboration, Project Scheduling, CAD/Drafting, Fixed Asset, Imaging, Service Management, CRM, Contractual Document Production, and Third Party Reporting Tools. 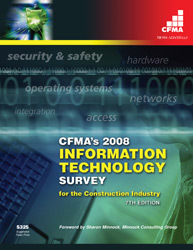 And only CFMA's 2008 IT Survey highlights hard-to-find information on technology use in the construction industry, presenting the results by contractor type and revenue size.